Giggle wiggle is EN-1888 certified for safety of babies & toddler. 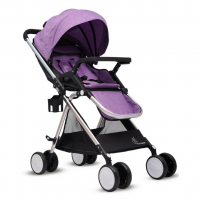 This stroller has air light aluminium frame, which makes it super light & durable. Adjustable leg rest of this stroller makes your baby comfortable while strolling. Simple mechanism to make seat recline in multi position. This stroller has got huge storage basket to keep everything. Lockable front wheels with suspension. To Recieve updates and possible rewards for R for Rabbit Giggle Wiggle (Grey) please sign in. To Recieve updates and possible rewards for Strollers & Prams please sign in.